MARCELLA liked to play up in the attic at Grandma's quaint old house, 'way out inthe country. There were so many old forgotten things to find up there. In an old leather bag she found a number of tin-types of queer looking men and women in old-fashioned clothes. And there was one picture of a very pretty little girl with long curls tied tightly back from her forehead and wearing a long dress and queer pantaloons which reached to her shoe-tops. And then out of the heap she pulled an old rag doll with only one shoe-button eye and a painted nose and a smiling mouth. Her dress was of soft material, blue with pretty little flowers and dots all over it. Forgetting everything else in the happiness of her find, Marcella caught up the rag doll and ran downstairs to show it to Grandma! 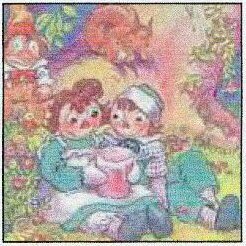 Her father Johnny Gruelle, saw infinite possibilities in that old plaything, so he repaired her and gave her a name. 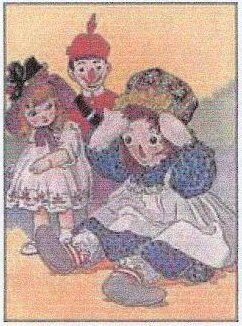 With her shoe-button eyes and winsome smile, Raggedy Ann soon became the beloved playmate of Gruelle's young daughter, Marcella. When Marcella Gruelle fell ill , her father would entertain her with stories using her own dolls as his characters. When Marcella died at 13, her father was devastated. 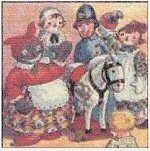 But knowing how much his daughter had adored Raggedy Ann, he began writing down some of those stories that were eventually published. 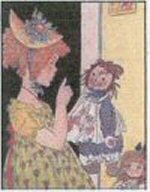 Gruelle soon gave Raggedy Ann a brother named Raggedy Andy, and through the years the two floppy rag dolls acquired many other wonderful storybook friends. All inhabitants of a very special world, where dolls come alive and enjoy magical adventures when no mortals are present or in Gruelle's familiar words," the real-for-sure people were gone or fast asleep. Many of these wonderful books can only be purchased from Collectors, but some have been reprinted and are available for sale in bookstores today....once again to be enjoyed by children of all ages..
Gruelle averaged one new book each year for twenty years. The books and dolls have remained popular for the past century. Raggedy Ann will celebrate her 97th Birthday on September 7th 2012.
would appeal to other "little girls". The earliest Raggedy Ann dolls "documented"
were offered by the P.F. Volland Co.
along with Gruelle's new book. To View a List of most of Gruelle's books and to find links to several that are available to read on line....I invite you to visit my "Gruelle Storybooks"page.